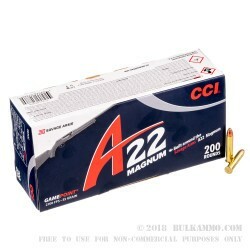 Whether you’re headed into the wild for some varmint hunting, or just doing some afternoon plinking, this 22 WMR ammo from CCI is a great choice. 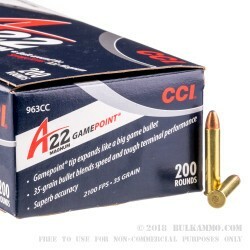 It is equipped with a 35 grain bullet with a Gamepoint tip designed to mimic the expansion effect of big game rounds. Each round contains CCI brass and priming. 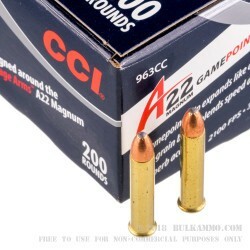 Muzzle velocity for this round is right at 2100 feet per second. Hailing from Lewiston, Idaho, CCI is a well-regarded manufacturer in the shooting industry, especially in rimfire loads like this 22 WMR. 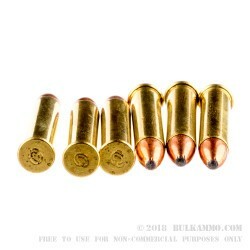 They make an excellent product, perfect for your next day in the woods or at the range.